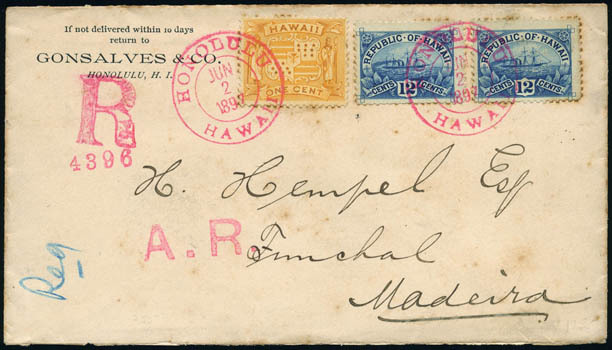 Gonsalves & Co, Honolulu, H.I., printed corner card on registered cover to Funchal, Madeira bearing 1¢ yellow (75) and two 12¢ blue (78) singles, all tied by two strikes of red "Honolulu, Hawaii, Jun 2, 1897" cds, matching "Registered, Hawaiian P.O." registry and "A.R." handstamps, reverse with Lisbon (6.27) arrival cds, Very Fine, An attractive and scarce registered use to Madeira Islands. Peters-Uota No. GC-CC-2 Estimate $400 - 600. 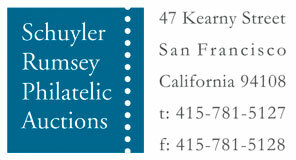 A link back to Sale 65 - Lot 327, along with its description, will be appended to your message.